Can you powder coat polished aluminum or does it always have to be bead blasted? Will it adhere properly? You can powder coat anything metal (and a lot of other things as well, with or without "proper prep". Clean Polished aluminum is something that gets coated ALL THE TIME, by many coaters... with the caveat that it is not the optimal prep, and may not adhere as well as a properly prepped item, and should be treated as a decorative item with extra care to avoid damage and excess exposure to harsh situations and constant weather... Also the durability will be lesser than a properly prepped piece, in regards to things like off-road use. Basically if its mostly for show, and the customer has no problem with that set of possible issues... it will be done. But the customer should be informed it is not best case and should be expected to a lesser application. 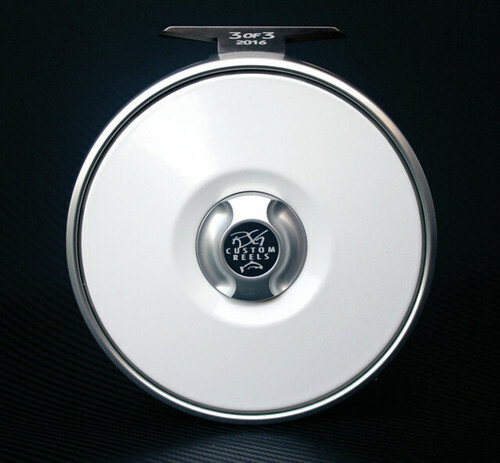 (even though in a lot of cases, the powder still lasts well and is very durable). Most people who coat directly over polished Aluminum are looking for a candy or translucent finish that "pops"... and usually for show, so they generally care for it like a show piece. Others treat it like standard powder coating and sometimes that doesn't;t turn out well for the finish over a short time. Thanks for the response Scottrods! The parts will see some weather and a bit of rubbing by from hand exposure as they are parts of a fishing reel. 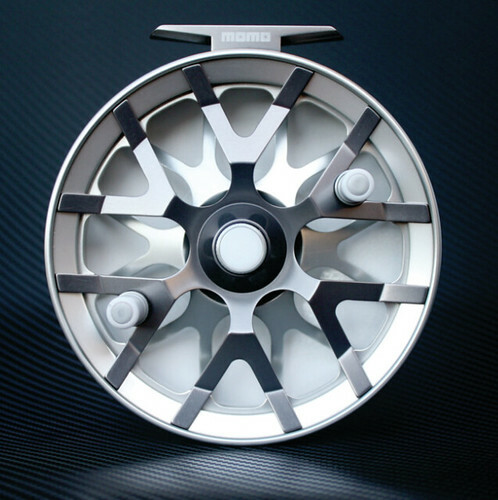 Much like a fly reel but known as a centrepin reel. The paint I have chosen is Chameleon lemon lime which, after receiving it and some swatches it would appear to be opaque anyway so a polished finish may not be necessary. I can soda blast for better adhesion if this is the case. So, my next question is this. I was somewhat disappointed with the swatch with regard to it's colour shift intensity. I thought it would change colours more intensely but it does not. They sell a chameleon additive and I was wondering if I could add some of that to the powder paint for more colour shift effect. I don't know how the color shift will look with the additive, but I have used some pearls and flakes in the distant past and find some combo's work great and others not so great. The most common Great versions work when shot over a dark or black base, and pearls and flake stand out as desired that way. Over the polished surface, I don't think it would do much... but not a tough decision as the piece you're talking about is very small and easily stripped and recoated. If it were a chair or even something like a valve cover with a ton of detail I'd probably look to known outcomes. Candy/translucent Yellows and golds are typically less than exciting when done, unless you use a silver base metallic or super chrome type base coat. As far as prepping the surface with Soda blasting... might as well not if that's you're thought for prep. A Light dusting to "frost" the surface with an abrasive media would be where I'd go, then a base coat of what you like and then top coat to get your final desired results. Now... if these reels are going to be exposed to salt water fishing... I can't really comment on how well things will hold up. All of my fishing equipment experience has been on fresh water applications... which are definitely more likely to last longer due to no salt exposure. I agree with you regarding wear capabilities and as such would never coat the spool or other parts of high wear but the parts I'm doing are inset on the back of the reel which will only have minor hand rub against it periodically. I've done a few this way a while back or should I say "had" a few done (but of course now going to do it myself) and they have held up well for the last three years now. I want to apologize in advance for all the questions, I do appreciate your time but you bring up some good points and raise a few more questions for me that I'd like to know more about. How do you stripe coatings? Solvent or blasting? How do you know when you have the right amount of coating on the part? Do you need to "ground" your work area? I've read every metal piece (compressors and so on) within 9 feet of your spray booth (including the booth) should be grounded to a good "earth" ground to avoid issues with the coating process? Is "Gassing out" your parts in the oven first an important process? Can the powders be stored in the garage where there is humidity during summer months? Sorry for all the questions. You need to know anything about anodizing, I can help but as for powder coating, I'm a noob! Some answers... Others may have things to add as well. How do you strip coatings? Solvent or blasting? I have stripped using both Chemical Strippers and By Blasting, using a variety of blasting media, depending on the substrate. The softer the substrate, the more attention needs to be paid to the media type, less abrasive materials on Aluminum sheet for sure... Aluminum cast parts will handle a little more aggressive stuff, but still be careful not to remove detail if that is an issue.what to use will come with experience... you may win some you may lose once in a while... but careful thought will usually prevent much loss. I prefer to blast anything that has paint, but powder requires strippers most times, to avoid damaging the part with Abrasives. No matter the size or materials... this is my recommendations. Although can begone, I;d likely buy in smaller lots of possible and keep the powders stored in a cool dark dry place... a lot of guys like to keep an old fridge around for storage... but making the powder cold, then introducing it to a nice warm humid day is like pouring water in the powder, in my estimation... Cool - Dry - Dark of possible. Find a corner in the bottom of a closet in the house if the humidity is kept relatively low. Wow! I really appreciate your insight! Thanks for taking the time to help me. For now I am still building everything, I used to do my blasting outside where I worked for( a satin finish) only as it pertained to anodizing but now building a proper blast cabinet with a Tacoma system upgrade and changing to crushed glass media to accommodate both anodising and powder coating. I also have an ultrasonic cleaner which I might try for parts cleaning when I powder coat. I'm quite a ways away from actually powder painting anything but when I do I'll be sure to make a post when I finally get around to running my system to show my results. The Ultrasonic cleaner will do a lot for the hard to clean bits that are oily or greasy as well. I don't typically think of many people having such. That could be a great asset in coating. The hardest thing about posting on here is getting a picture up that anyone can see... they all come up as postage stamps and smaller for the reader. If you can post to a hosting site then link, it would be a great help for those looking. LOL, No worries about typos, I get it.... As for pics, I hear you, it's frustrating when I try to look at an image from someone on the anodizing forum. I have no issue with uploading good size images using Flickr, here's an example, and happens to be one I added a pearlescent powder coat to the backplate insert. Thanks for the kind words. You can't see it in the pic but it has a nice iridescent fleck in the coating! Actually it's a single action center pin reel so there are no gears or breaks on them. The only mechanical component on them is a hidden locking mechanism to stop it from free spooling while not in use.